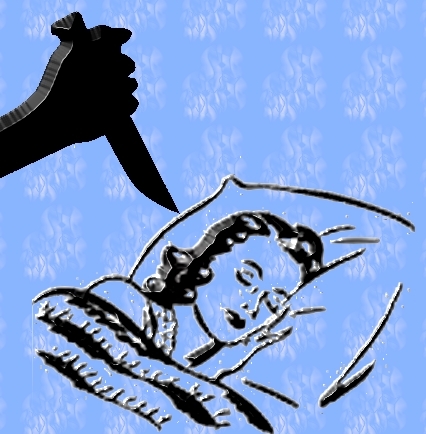 ﻿Bruce Goodman's "Hack n Ripper"
It was yet another dark and stormy night. Emma lay in bed with the lamp on, staring at the ceiling. She was listening to her little radio. A serial killer, known as Hack n Ripper, had escaped from the local prison. Dear me. Emma failed to notice. She turned out the light, drew the bed covers tightly around her neck (she couldn’t stand having a draughty hole in the bedding) and slumbered off. How sweet the dreams! How never the morning.